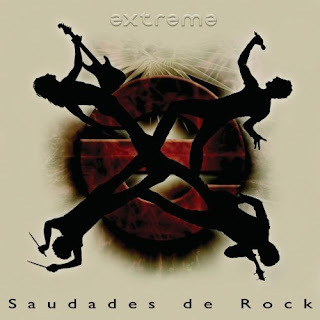 Hall of the Mountain King: Review: Extreme, "Saudades de Rock"
Review: Extreme, "Saudades de Rock"
I was still in the throes of my rock star dream when Extreme released its sophomore effort, "Pornograffitti," in 1990, and I spent months with guitar in hand trying to copy Nuno Bettencourt's licks. I never did get all the licks down, and probably never will. But, putting aside the simplistic overplayed megahit "More Than Words," it remains one of my favorite guitar records ever. Now, a reformed Extreme (minus drummer Paul Geary who now manages the band instead of playing with them) has delivered its first record since 1995's "Waiting for the Punchline," and there's good news and bad news. First, the good news. The shred is back. I've been quite disappointed by Bettencourt's work since the breakup of Extreme, and I've often felt his talent was wasted in more recent projects. Here, he delivers up licks likely to keep me trying to twist my fingers into pretzels for months to come. Vocalist Gary Cherone and bassist Pat Badger also deliver fine performances. Cherone shows great range on the variety of sounds here and proves himself to be a better singer than I ever gave him credit for. Then, there's the bad news. After a strong first five tunes, you'll be hitting the skip button -- often. "Saudades de Rock" lacks the flash of "Pornograffitti," but it also lacks the pompous artiste turns of "III Sides to Every Story," so I guess it balances out. What it delivers is a pretty good collection of 1970s influenced rock, playing up to the influence of Queen ("Star") and Aerosmith (just about every tune on the record.) As mentioned above, the first five songs on "Saudades de Rock" are solid, ranging from the poppy "Star" to a hard rock groove on "Comfortably Dumb" to the country-flavored "Take Us Alive." After that, the better performances are scattered. There's an overabundance of ballads here, as you'd sort of expect, and only the U2-influenced "Ghost" makes an impact. The rest are just sort of there. Track 10, the Aerosmith-meets-James Brown funk rocker "Slide," is one of the best on the record, but after that you can really skip back to album opener "Star" without missing much. Still, when it rocks, it rocks, and when Bettencourt cuts loose, he's as impressive as ever. It's definitely worth a listen for fans of the band or great guitar. Review: Alice Cooper, "Along Came a Spider"